Home | Music | Bios | PR | Upcoming Shows | CDs | Contact Us! 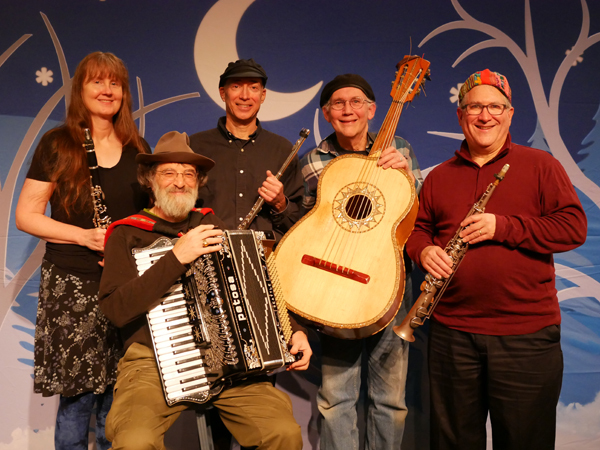 Klezmer and Jewish Music with a Spritz! Jay Krulewitch leads most of the tunes with his sprightly sax lines. A lawyer involved in civil rights issues, he's well known in the jazz and blues circles around Seattle. Carl Sayres amps up the Katz with his to-die-for operatic tenor, and brings a knowledge and love of contemporary music to the group. Would you believe Jewish rap? Harvey Niebulski squeezes his accordion in between a career as a radiologist and avid participation in the Seattle folk community, sitting on the Folklife board of directors. Marianne Tatom is a PhD music theorist, a freelance editor with a wide clientele, and, not incidentally, a musician with a sharp ear for the vocalisms of klezmer clarinet. Brad Spear, lawyer by day, flautist by early evening, brings a tempering gentleness to the Klez Katz sound with his limpid, classically trained flute playing. Thaddeus Spae, when he isn't playing guitarron bass, is the resident trombonick of the group with a 1940's vintage Olds bass trombone that he's owned since he was 13. No fair asking how old he is now.